Today, we explored the Pylia, the area around Pylos in Messinia, forming the very southwestern tip of the Peloponnese. Our stations were the Archaeological Museum of Chora, the archaeological site of Epano Eglianos, better known as the so-called “Palace of Nestor”, the modern town of Pylos, overlooking a stupendously picturesque bay that was the venue of major military events in 425 BC and in 1827, and the stupendous Venetian and Ottoman castle of Methoni. The site known as “Nestor’s Palace” and the Museum at Chora form a pair, as the latter is nearly entirely dedicated to the finds from the former. It is an old museum and a small one, and it will need to be renovated before long (not at least as there is important new material waiting to go on display), but even as it is, it contains fascinating and important finds. On the site of Epano Eglianos, a major Late Bronze Age, or Mycenaean, Palace was discovered by American archaeologists in 1939, and excavations have been taking place there intermittently ever since, revealing a substantial structure, a complex building of mud-brick and wood on a stone foundation, containing many rooms and yielding thousands of artefacts. A lot of questions about Mycenaean Greece remain unanswered, but we can say with certainty that the site was an important centre of power, almost certainly the Bronze Age capital of a Messenian state, and that a series of activities took place in and around the palace, including the administration, storage and distribution of agricultural produce, the official seat of political leaders or royalty, feasts, the production of luxury items (perfume), feasting, and religious ceremonies. We also know that the ‘Palace’ was constructed around 1300 BC and suffered a fiery destruction not long after 1200 BC. Of course, we also know that Homer places the wise old king Nestor at his “sandy Pylos”, and even that its Mycenaean name was indeed Pylos (although modern Pylos is quite a distance further south), but we cannot know so far whether a ruler called Nestor existed here, or anywhere, in the era of the Trojan War, some 500 years before Homer’s epics were composed. The museum at Chora displays only a small fraction of the finds from the “Palace of Nestor”, but they are sufficient for me as Peter Sommer Travels’ tour expert to give an impression of 14th century BC life at a Mycenaean centre. 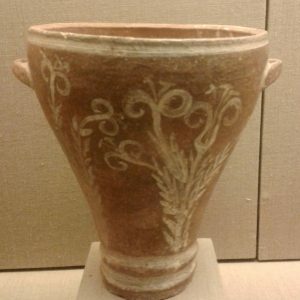 The artefacts include countless pottery sherds and whole pots, including storage vessels, cooking wares, transport vessels, specialised containers for perfume and innumerable pots used in the storage, serving or consumption of wine, most notably thousands of drinking cups. 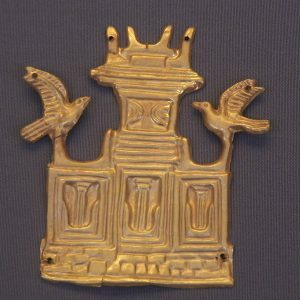 There are also fragments of fine jewellery in gold, amber, glass, ivory and other materials, pieces of weaponry, and tools made of bronze, stone or bone. There are imported items or materials from Crete, the Aegean, and areas much further away. An archive of clay tablets, inscribed with the script known as Linear B, the earliest known form of Greek, provides valuable information on the Pylian economy and underlines that the area was an established part of the Mycenaen World, a Greek-speaking culture or civilisation that covered a large area, from Central Greece via Attica and the Peloponnese to Crete and the Aegean Islands. The most evocative finds from the “Palace of Nestor” are perhaps the numerous fresco fragments. 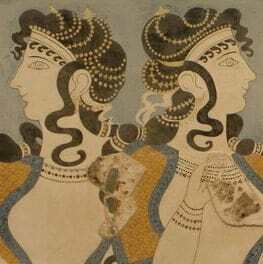 Comparable with the Bronze Age paintings from sites like Mycenae, Tiryns, Thebes, Knossos or Santorini, they are a facet of Bronze Age visual art. At Pylos, such bits of painted plaster were found in many parts of the structure, indicating that the walls of all the major rooms bore copious painted decoration. They include a wide array of motifs, among them flowers and plants, ornamental patterns, real and fantastic animals (e.g. dogs, deer, birds, lions and griffins). There are also numerous human figures, at least some of which were part of narrative scenes, such as a procession, a depiction of a musician and a battle scene. The image I have chosen here is a small fragment of a larger fresco, found on the northwestern slope outside the palace proper. It depicts a human face in profile, with neck, chin, lips, nose and eye clearly visible. In all likelihood, this is the face of a young man (as indicated by its red hue), but we will never know whom the image depicted, a real person or an imaginary one, what he was doing or what it meant. This Bronze Age face may be beautiful, but it is forever an enigma. Tomorrow, we visit Ancient Messene, one of the most impressive archaeological sites in the Peloponnese.